Where do we look to find the presence of God in the midst of Hurricane Harvey? Perhaps some would look to the strength of the storm and the capacity of the torrential rain to wreak havoc—or vengeance, as it were. Some might see judgement in the devastation, others might perceive the power of the Almighty to overwhelm the paltry efforts of humanity. Me, I’d rather take a page from St. Paul’s letter to the Romans which we heard this morning, and look to the remarkable compassion reflected in the lives of ordinary people and how they responded to an extraordinary situation. Compassion, and a call to action is where I saw God at work in Houston this past week. Perhaps you did as well. In spite of writing some of the most poetically beautiful language found in the Bible, St. Paul was a remarkably practical individual. While there’s no doubt he considered what people believe to be important—by and large, he focused his attention on how people behaved. Today’s reading from his letter to the Romans is a case in point. Notice that Paul uses active verbs to convey the importance of living our faith. He writes: “Rejoice in hope, be patient in suffering, persevere in prayer, Contribute to the needs of the saint; extend hospitality to strangers, Bless those who persecute you, Rejoice with those who rejoice, Weep with those who weep…Live in harmony with one another…associate with the lowly…” In other words, if you want to see--really see the activity of God in the world—you need look no further than the people of God living and acting in the world around you. 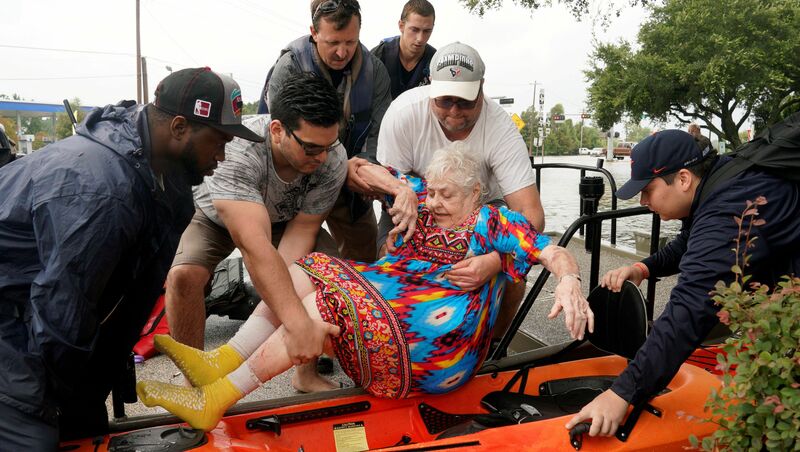 In the midst of what has been a perfectly horrible week for most people in the city of Houston and surrounding areas, there are a remarkable number of inspiring stories of people simply evidencing the best of human nature. From ordinary civilians who assembled a flotilla of bass boats, kayaks, canoes and other sundry crafts in order to rescue the citizens of a beleaguered city, to others who opened homes to sodden strangers, we’ve seen a remarkable panorama of ordinary people helping people. State officials checked in and, Dearing reported: “The shelter had 126 people at last headcount. Six were medically fragile. Four needed oxygen… Everyone was calm because they had just been fed.” What service are you with? Asked Katie Contrera, of the Texas Emergency Medical Task Force. She was shocked to learn Dearing was a civilian with no medical experience. Dearing organized people to raid classrooms for supplies including trash cans, hand sanitizer and rugs for people to sleep on. His ad hoc team collected food and water from people who brought it and handed it out to those who needed it. For St. Paul, being a Christian wasn’t about having your name written on a membership roll. It was primarily about being in relationship—in relationship with God, and with the people of God. In his letter to the Romans, St. Paul speaks of the importance of providing hospitality. In the end, that hospitality is less about providing an experience such as what we would encounter in a well-appointed bed-and-breakfast, than it is about responding to the needs of those around us—to the absolute best of our abilities. It means stepping up to the challenges of life that confront us. We’re safe and relatively dry here in Massachusetts. Our neighbors to the south are not. Their needs, past the crisis of these last few days are going to continue for months—even years. How we respond is a reflection of God in our lives, it is an indication of our deepest held and most firmly cherished beliefs. We need look no further than the words of St. Paul to guide us in how we should mobilize both our hearts and our hands to be of help to those broken in spirit, bereft of home and suffering loss. In Jesus’ name. Amen.